Brahm Revel and his simian soldiers will return to the jungles of Vietnam next spring with the release of a third Guerillas graphic novel from Oni Press. The creator, who also recently worked on a Marvel Knights: X-Men series for Marvel, announced the third volume on his blog. 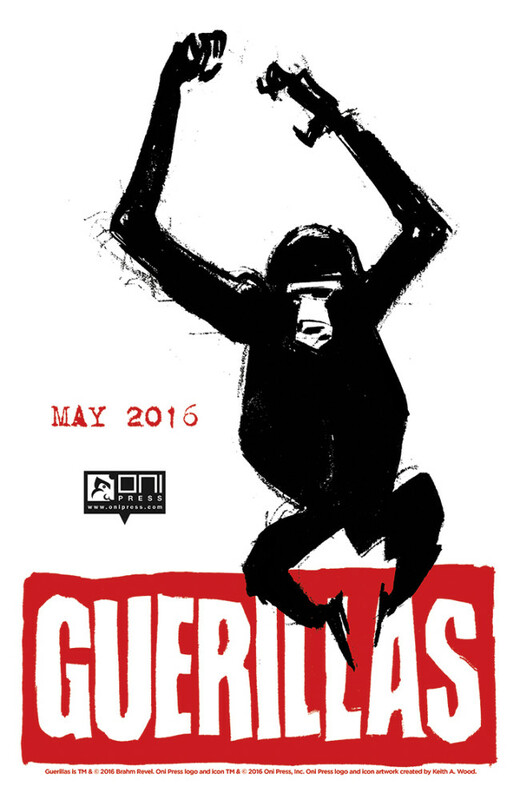 Guerillas started as a series at Image Comics in 2007, then moved to Oni Press in 2010, who published the first and second volumes as graphic novels. Revel also ran a Kickstarter to bring the second volume to life. In Guerillas, Private John Francis Clayton is thrown into the Vietnam conflict and manages to survive thanks to an experimental troop of chain-smoking, gun-wielding chimps who come to his rescue. On the surface, it’s an action-packed war story where the Alex Toth-like black-and-white artwork brings the conflict to life. Digging deeper, it’s a well-crafted story about the horrors of war, experimentation and the human condition … featuring apes with machine guns. Let me emphasize that last part: APES WITH MACHINE GUNS. Jimmy Palmiotti and Darwyn Cooke have brewed up a new six-panel story that draws inspiration from the old Charles Atlas ads that appeared in comics starting in the 1940s. But you won’t find it at your local comic shop today — you’ll only find it in Chicago-area liquor stores. 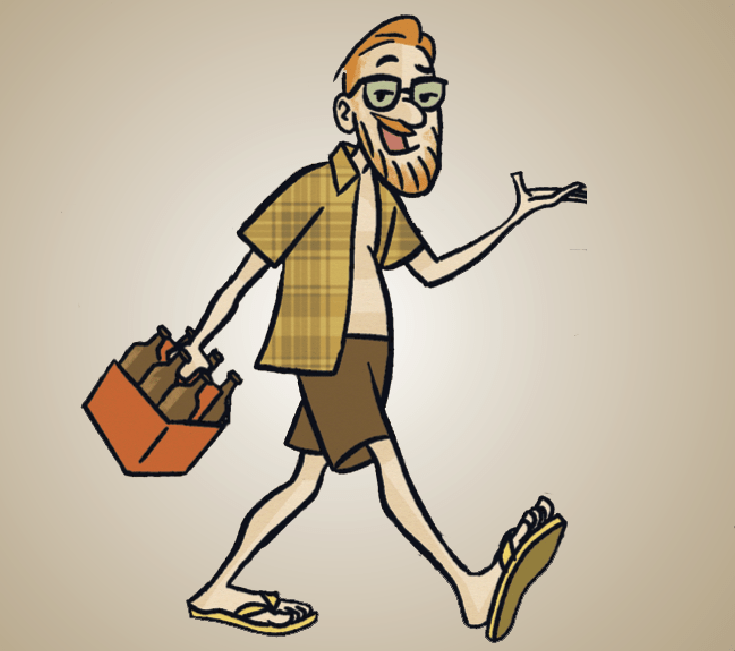 As a part of Chicago-based Arcade Brewery’s “6 Pack Stories” line of beer, Palmiotti and Cooke’s comic appears on labels of The Adventures of Dutch Courage, “an incredibly complex Session Ale brewed with Juniper Berries and Lemon Peel,” according to the brewery’s website. Each panel of the story appears on one of the six-pack’s bottles, so you’ll want to drink them in the right order. Volume one of Arcade’s 6 Pack Stories” featured a comic by Jason Aaron and Tony Moore, and was released in 2014. According to a post on their Facebook page, the beer will be available at three locations today, followed by distribution around Chicago by the end of the week. Although he’s written his share of secret agents in the past — John Stone keeps popping into my head as I write this — Warren Ellis will soon get his hands on the ultimate super-spy when his run on Dynamite’s James Bond comic begins later this month. Find out why Archie and Betty broke up Nov. 25. Fans of the relaunched Archie series have two things to look forward to in issue #4. First, of course, is the addition of artist Annie Wu, who joins writer Mark Waid on the series, and second, the revelation of what exactly “The Lipstick Incident” was. Archie #4, by Waid, Wu, colorists Andre Szymanowicz and Jen Vaughn, and letterer Jack Morelli, arrives Nov. 25. Taylor takes over as artist from Nate Bellegrade with issue #7, which arrives in January. Nowhere Men, the “scientists-as-rock-stars” comic by Image co-publisher Eric Stephenson, artist Nate Bellegrade and Einser award-winning colorist Jordie Bellaire, will return in January with a new artist, Dave Taylor (Batman: Death by Design, Judge Dredd, Prophet). Trade paperback collecting season one arrives in February for $9.99. Oni Press has announced that Kaijumax, Zander Cannon’s excellent giant monster/prison mash-up comic, will return next May for a second season. In addition, the first season will arrive in trade paperback in February, for the low introductory price of $9.99. “You like monsters? YEAH! You like prison? MAYBE! C’mon in and join me for Kaijumax Season 2; the first trade is big yet cheap so people can jump aboard, and I will try not to brutalize or kill off any beloved characters this season. No promises,” Cannon said in the press release. Kaijumax, which probably shares more in common with Oz or Orange is the New Black than it does a Godzilla movie, features a prison for giant monsters that’s made up of all sorts of interesting characters, from the various monster inmates to the guards who keep an eye on them. Its large cast includes some of the most inventive characters we’ve seen in a long time, both visually and personality wise, and it mashes together genres to create something that embraces the silliness and seriousness of both. If you haven’t checked it out, the priced-to-move trade may be up your alley. One of the things I find fun about Tumblr is seeing how much influence pop culture has on the many artists I follow. For instance, “black suit” Daredevil was all the rage when the Netflix series debuted, while Mad Men tribute pieces had their day when the series ended. And let’s not even get into Donald Trump. But the one thing that’s really made a huge impact — I still see new images in my feed to this day — is George Miller’s Mad Max: Fury Road. Help drop-kickstart a new wrestling-themed comics anthology featuring Box Brown, Zac Gorman and more. Comics and wrestling have been tag-team partners for years, whether you’re talking about comics starring wrestlers, wrestlers writing comics or even comic heroes fighting super villains in the ring. It’s no surprise that wrestling counts many comic creators among its fans, and several of those creators have come together to create Muscle Temple, an anthology of wrestling comics. Spearheaded by Frank Gibson, the anthology features enough creators to fill a battle royal, including names from webcomics, alt.comix and animation. Together they will publish a “60ish” page, two-color comic featuring “funny and weird short comics and goofy illustrations about our love and passion … PRO WRESTLING!” The roster includes Box Brown (creator of Andre the Giant: Life and Legend, one of the best wrestling-themed comics in recent memory), Zac Gorman (creator of the wonderful Magical Game Time), Jimmy Chang (whose Secret Item World webcomic I’ve been binge-reading over the last few days), Rosemary Travale (The Champ), Sam Alden, Amanda Meadows and Geoffrey Golden of the now-defunct The Devastator, and many more. They’re currently looking for funding via Kickstarter, with prizes that include limited edition prints, T-shirts and your very own stop-motion puppet by Rosemary Travale — and of course the book itself, which can be yours for $15 plus postage. Check out some art below, or visit their Tumblr to see more. Joshua Hale Fialkov and Gabo created one of the past few years’ most interesting and original premises in The Life After, a story set in Purgatory where a man teams up with Ernest Hemingway to fight the divine powers that be. Jude has been sent right back where he started: Purgatory. With no memory of his previous adventures or relationships, Jude’s existence is stark and empty. Yet, just outside his awareness, his friends—including the late, great Ernest Hemingway and a very tenacious preteen girl—struggle to free him. Because in the quest to overthrow God himself, the only person who stands a chance is his son. Check out a preview of the first issue below. If you missed the first series, it’s been collected and can be found at finer comic shops or on comiXology.